Tonight is the big night in politics. The rumble in Long Island. The thrilla in the villa. Trump versus Hillary in a steel cage death match. At least that is how it seems by all reporting and the fevered pitch people are behaving in. While this feeding frenzy is expected from a carnal world it is quite disappointing to continue to see Christians foaming at the mouth over who might be the next King of Sodom. The foam is primarily for candidate Trump in Christian circles as they usually rally around the Republican offering, regardless of the actual proximity of Jesus Christ to that individual. For example, in 2012 Christians all lifted up Mitt Romney for president despite the fact that he was a prominent member of the satanic cult of Mormonism. It is vitally important that we understand the nuances of which we are speaking. As a citizen of the United States, we are free to vote for whomever we want but that is a carnal distinction. As a Christian we have absolutely no imperative to vote at all and anyone who tells you otherwise simply does not understand the Bible. So the problem is not that Christians chose to vote for Mitt Romney it was that they presented him as the "Christian" choice. They bragged about it. They threatened other Christians to try and convince them. To convince then that Romney was somehow the choice of God. The Billy Graham website even removed Mormonism from their list of cults before the election. God gave us someone as unchristian as a Muslim or atheist in 2012 and Christians chose him. We embraced him. We defended him. This year, God has given us an even more absurd choice in Donald Trump. I do not need to rehash the details because at this point, Christians everywhere are making the most pathetic and fleshly excuses for all of his antics, behaviors, and statements. It is just so sad to see that in 1996 Christians everywhere demanded character over everything else in a presidential candidate and within 20 short years we have devolved to supporting a man that is bankrupt of all character. If Christians needed any further confirmation that they need to stop rallying behind this present evil, look no further than Touch Heaven Church in Canfield Ohio and Pastor Frank Amedia. It seems Pastor Frank's wicked heart has convinced him that he is to call for a day long fast and prayer today starting at 6 AM and going through the debate tonight. He is "interceding to pull down strongholds, expose and strike down adversarial plots and strategies and bind every force that opposes the will of God." Uh-huh, what? No "breaker anointing" prayer? He further prays for the release of supernatural gifts upon Mr. Trump of grace, favor, wisdom, revelation, power, peace and presidential authority. 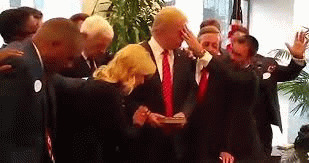 I must have missed that chapter in the Bible that discusses the supernatural gifts of power and presidential authority; let alone where we can pray for such things for someone who has openly said that he does not believe he has to ask God for forgiveness, despite being on his third marriage. As ridiculous as all of this is already, Pastor Frank then decided to rally the troops around him for this prayer initiative. He reached out and found support from Cindy Jacobs, Rick Joyner, Sid Roth, Lance Wallnau, and Paul White to name a few. I guess Mike Murdock and Kenneth Copeland were too busy with other heretical initiatives. What a lineup! This has to be considered a cornucopia of false teachers and prophets. Cindy Jacobs is a self-appointed "General" and proven false prophetess. Rick Joyner is also a false prophet and involved heavily in both the New Apostolic Reformation and the Kansas City Prophets. Sid Roth is the host of "It's Supernatural"; a cable show that routinely traffics in the false signs and lying wonders and promotes heretics across the globe. Lance Wallnau is another false prophet who recently tried to pretend that God showed him Trump is a wrecking ball and that he might be used as God used King Cyrus. Paula White of course is one of the most egregiously heretical pastors on the planet. She has bilked over five million dollars from the sheep of the Lord by making merchandise of them and the Gospel by preaching for shameful gain the things she ought not. Also on her third marriage, White shamelessly plugs Pentecost and Passover as times to send her money for God's favor and regularly will use numbers such as Psalm 25:3 to mean you have to send her $253 dollars. So these are the "Christian" leaders calling for prayer and fasting for Donald Trump? What does it say to you as a believer in Jesus Christ that his sworn enemies are lining up on the side of Trump? That people who spend their lives scattering people away from Christ and consigning people to hell through false gospels and false christs are on your side? Are you prepared to hold hands with Paula White and intercede for someone this vile before God? To tie your spirit to General Cindy Jacobs and Sid Roth? Be very careful of the company you keep beloved. Be very careful who you take allegedly righteous stands with. I understand that maybe you think he sends a message to America that is closer to Christ than the other side but consider the key verse from today. Whoever sends a message by the hand of a fool cuts off his own feet and drinks violence. What does that mean? You remove the opportunity to disassociate yourself from a fool by sending a message through him. When he mocks people -- you are mocking them as well. The reactions to a fool vary but violent reactions are hardly unexpected. Just look at the discourse between people in this presidential race. Why in the world would you want to be associated with that? We ought to care about our witness for Christ; not our witness for Trump. Stop sending a message by way of a fool. Wait a minute preacher! Are you saying Christians shouldn't vote for Trump? Don't you know what the other side stands for? Don't you know the platform of the Democratic Party? Yes I do. Parts of it are abhorrent to God and parts of it are pleasing to God. Same as the Republican platform. This is not about who you can or cannot vote for. As already outlined, God does not care who you think will make the best King of Sodom. We are free to vote for whom we want but we need to stop pretending our choice has anything to do with God. This is about defending evil, even if you have determined it to be of a lesser variety. This is about lining up with false teachers and prophets in pretending that there is anything vaguely Christian about Donald Trump. This is about sending a political message to the world when they need a Gospel message. This is about sending that message to them by the hand of a fool.